What is in those fuel canisters, anyway? Is Brand X’s fuel really any different from Brand Y’s? In this article, I’ll discuss what makes up MSR’s IsoPro™ fuel and why it’s some of the best canister fuel on the market. I’ll also share candidly where fuel canisters can sometimes be equivalent. Let’s start with the fuel itself. 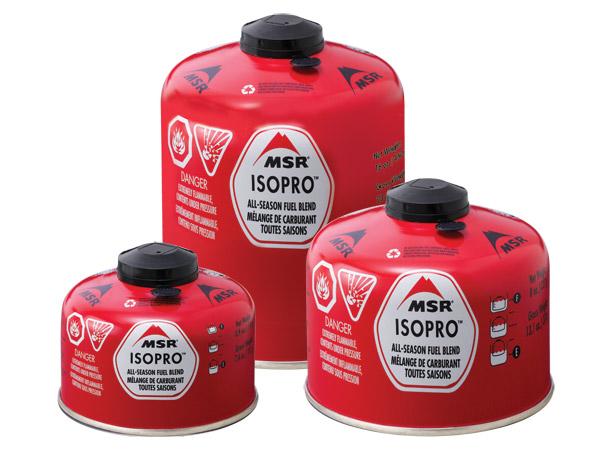 Backpacking canister fuels, such as MSR’s IsoPro, typically use a blend of propane, isobutane and/or butane. Each of these fuels falls into the general class of Liquefied Petroleum Gas (LPG), but there are some important differences between them that can have a real impact on the quality of your stove experience—particularly if you camp in cold weather, or go for long trips and use your stove for more than a few minutes at a time. The key difference between propane, isobutane and butane is what’s referred to as their “vapor pressure.” Vapor pressure describes a fuel’s ability to vaporize and keep the canister pressurized at a given temperature. LPG fuels exist as liquid under high pressures and in cold temperatures. Pure propane, for example, is liquid at -44°F/-42°C at sea level. You could pour it into a cup and it would sit there like water without vaporizing off. For this reason, pure propane wouldn’t do so well to power a stove in those kinds of extreme conditions. Fuel canisters filled with a low-vapor-pressure fuel lose their pressure faster during use because as fuels vaporize, they cool. The combination of the low-vapor-pressure fuel and this natural cooling phenomenon leads to very poor stove performance. And, when outside temperatures are cold, low-vapor-pressure fuels will fail to perform altogether, while other fuels or fuel mixes will keep on charging. Sea level boiling point: -44°F/-42°C. Of the three types of common LPG fuels you’ll find in the camping section, propane provides the highest vapor pressure and therefore the best cold-weather performance. And while that’s a good thing, pure propane requires a much heavier canister to safely withstand that high pressure. This is why lightweight canisters often use a mix of propane and either butane or isobutane. Sea level boiling point: 11°F/-12°C. This is the next best thing to propane. Isobutane shares the same molecular formula as normal butane (see below), but the shape of its molecule makes isobutane far superior in terms of vapor pressure. Again, high vapor pressure translates to better performance. Isobutane is also a more expensive fuel to source and process than butane, so you’ll usually find it in the higher-quality canisters. Sea level boiling point: 30°F/-1°C. Butane lands at the bottom of the heap. It is the cheapest and poorest-performing fuel on the list. It delivers the lowest pressure and therefore the worst stove performance in many conditions. If you’ve ever wondered how your favorite big-box store can sell fuel canisters at such a bargain price, it’s often because those brands use 100% n-butane. But here some marketing honesty is important: If you only camp in warm weather and for short periods, you can likely get by with the performance n-butane offers. MSR IsoPro fuel is a mix of 20% propane and 80% isobutane. (Manufacturing tolerances allow up to 6% n-butane, but this is minimized as much as possible and typically falls below 2%.) Because we use isobutane (instead of the cheaper n-butane), and a higher-than-average proportion of propane, IsoPro fuel is undoubtedly top-shelf. Are there other fuels with the same mix? Possibly. 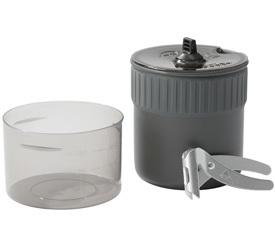 Again, in the interest of true transparency, many leading brands’ canisters are manufactured at one of two or three factories. This explains the pseudo-standardization of canister shapes and dimensions. But the fuel mix still varies by brand, and this can be difficult to ascertain. Moving beyond the chemistry of the fuel, let’s consider the canister itself. Many canisters use a standardized threaded Lindal valve. A canister with a Lindal valve should be compatible with any stove designed around this standard. And that compatibility generally does pan out. Fortunately for consumers, a European standard (EN 417) governs fuel canisters and the construction of the valve. So as long as the canister is well-manufactured, most consumers don’t have any problems using their stove with a different brand’s fuel canister. We cannot guarantee the quality of manufacture of any other brand. But by and large the reputable brands use good, compatible valves. Well, that’s the quick and dirty of our fast and clean IsoPro fuel. Happy cooking! Steve is the tallest man** to summit Mt. Rainier in the history of mountaineering. He’s been playing in the outdoors since he could crawl, and especially enjoys extended wilderness adventures. Some of his favorite trips have been sailing across the Pacific and back with his dad, big wall climbing in Yosemite and Zion in a homemade (read: dodgy) port-a-ledge, mountaineering in California, Washington, Alaska and New Zealand, hiking the John Muir Trail, and most recently becoming the tallest man** to summit Tiger Mtn. (elev. 3,005’/916 m) with his wife and 8-month-old son. 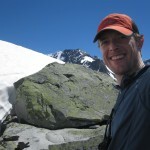 He has been developing outdoor equipment on his own and professionally for the last 16 years. He’s been at MSR for six years, most recently in the role of category director for Cook and Shelter. **This is an unsubstantiated claim.